A musical comedy that is very clearly a wartime recruitment film for the US Navy, Here Come The Waves stars the perennially popular figures of Bing Crosby and Betty Hutton. The WAVES of the title are the Women Accepted for Volunteer Emergency Service and the storyline of this 1944 movie follows what a great life both women and men can expect serving in the Naval service of the US military. The propaganda is so jaw droppingly obvious that even when the film was released it must have raised eyebrows. The opening song is called “Join The Navy!” a number which is so exuberantly performed that it appears enough to convince the nightclub singing twin sisters Rosemary and Susie to join up. From then on in we see a very happy, friendly training base before the servicemen and women start being posted to equally jolly and happy places. One character even says at the end of their training, with no hint of sarcasm, “I knew things would be tough, but I didn’t know there’d be so many laughs too!”. It’s the naval version of air force recruitment film Air Cadet – just much better done. There’s no subliminal message here – the point is clear and reinforced all the way through, to the point that a stage show within the film is set up to recruit new sailors and volunteers. Just think about that; a recruitment show, within a recruitment film. Bing Crosby as famous crooner Johnny Cabot is the star of this show-within-the-show, backed up by the singing talents of Betty Hutton as both sisters. Hutton plays the pair expertly as rounded characters, when the requirements only ask for one being scatty and blonde and the other serious and brunette. They are seen on screen together throughout using special effects trick photography which actually holds up incredibly well. In fact so well done is the split screen filming that if you didn’t know it was one talented actor performing both roles you might be fooled into thinking it was real identical twins. It’s certainly better executed than a lot of similar film-making done in the 1970s and 1980s. Of course both sisters (one a fan and one not) eventually end up falling in love with Johnny Cabot – because that’s the sort of thing that happens. The film has some of its basis in farce, and it’s inevitable that the sisters have to impersonate each other. Of course they do. With hilarious consequences? Well, hardly sides bursting hilarity, but it is amusing. One thing which is incredibly uncomfortable to watch though is Bing Crosby singing the Oscar nominated song “Ac-Cent-Tchu-Ate The Positive” – which was first written for this film. The reason it’s such an uncomfortable watch is that he does it in black-face. It’s part of the recruitment show within the film but in every respect happens for no apparent reason. We do need to take account of attitudes of the time, but it’s remarkable to discover that such a well known song was originally performed like this. Dubious choices of its time aside Here Comes The Waves is an enjoyable 100 minutes. Even if you don’t particularly like musicals, it passes the time congenially enough. The movie has an easy humour which makes it pretty fun to watch. The pacing is good, the story simple but neatly handled. 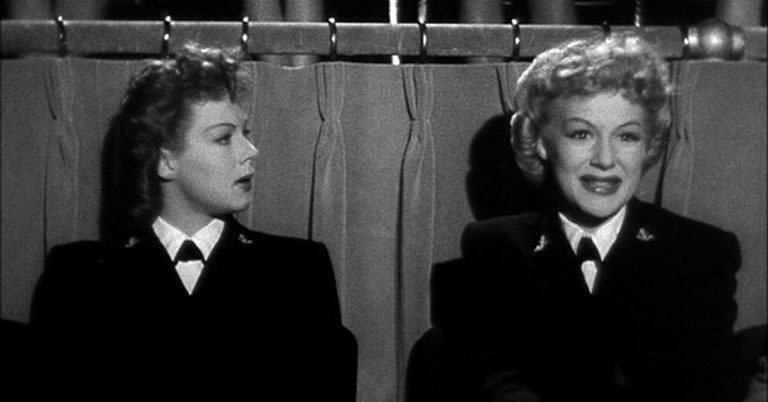 Although Crosby is the star of the film, Betty Hutton is the winner here – her performance as both sisters is superb. Here Comes The Waves is out on DVD on Monday 6th June.